In less than 2 months, year 2013 will end and we need to have 2014 Calendars soon to use. You can make a personalized calendar with your photos in it and it's perfect for personal use or as gifts to your relatives. I made numerous 11 x 8.5 and 8.5 x6 calendar templates with different themes at Artscow that is FREE to use. 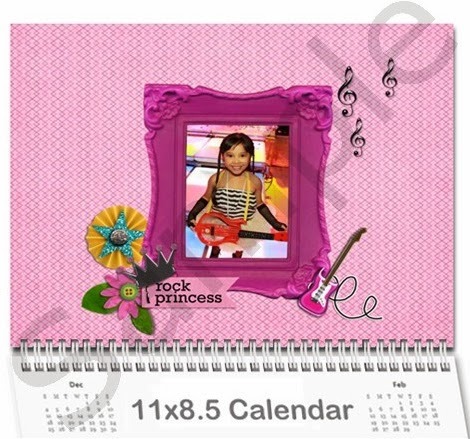 I have a music themed calendar that I named ROCK PRINCESS and you can order it for $11.99 and the 8.5 x 6 for $9.99. These days, rock star themed birthday parties have become the favorite of parents or party organizers for kids can enjoy the party with lots of dancing and singing. In this calendar, you can include your children's photos showing off their guitars or any musical instruments in every month of the calendar as I have included several photo frames on this template.